c.1841 Butter Creek Farm is a secluded compound on 22.73 country acres. With a 6-stall stable and 3-bay pole building, the property is ideal for horses or hobby farm. Butter Creek crosses the property and creates natural refuges as it tumbles down a rock waterfall creating a large pond, and meanders through the woods with trails. The 3 bedroom, 2.1 bath stone farm house built by Samuel Haring combines 19th century details with modern additions, creating large yet intimate interior spaces. The open plan comprises the sun room with bucolic views of pond and pasture, living room with wood-burning brick fireplace and dining room with exposed stone wall and room for large gatherings. Additions are centered on the renovated spacious kitchen with vaulted ceiling and skylight, exposed stone wall, quartz counters, custom soft-close cabinets and drawers, stainless appliances and farm house sink. The light-filled breakfast room with oak cabinets and Dutch door to a patio is at one end, and opposite is the sunny family room with flagstone floor, rich paneled vaulted ceiling, wood stove and walls of windows. French doors open to the conservatory with custom windows and mahogany millwork. The turned open-tread staircase with 2-story picture window leads to private quarters. The 2nd floor is the main bedroom with fireplace, built-in wardrobe, sitting area, full bath with shower and claw-foot tub and private deck with metal roof to take in superb views of this very special property. The 3rd floor accommodates two bedrooms, hall bath and convenient walk-in closet with cedar-lined storage. Perfect for guest house, the 2 bedroom, 2.1 bath "Bucks County TimberCraft" converted barn offers soaring spaces and 1, 834sf with great room, fireplace, full kitchen with quartz counters and stainless appliances, dining area, two en suite bedrooms, large deck and walk-out basement with laundry. The carriage house has 2-car garage with electric-car charging station and 600sf finished office with deck. The refurbished pool is privately sited, with sprawling lawn for outdoor play. Cross the bridge to the 28x50 3-bay pole building, 6-stall stable with tack room, water and electric, and 5 acres of fenced pasture. Walk or ride the mile of trails through the woods, along babbling Butter Creek. 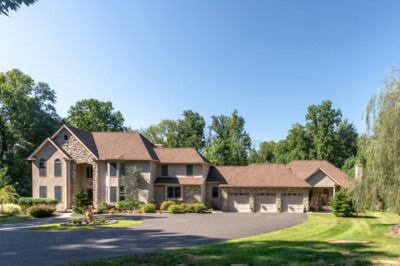 This well-maintained property is an hour from the Philadelphia Airport, and just outside of Quakertown.